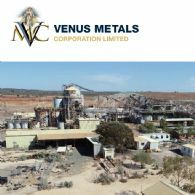 Venus Metals Corporation (ASX:VMC) is pleased to advise it has received an application from a professional and sophisticated investor for a private placement of 600,000 new ordinary fully paid shares at A$0.17 per share to raise A$102,000. 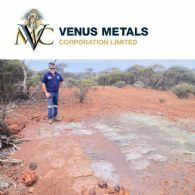 Spectrum Metals Ltd (SPX) has recently announced a "high grade gold discovery at Penny West" and subsequent high-grade assays confirming a new lode in their project area. 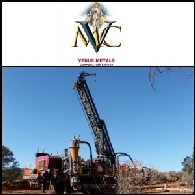 The Company completed scout drilling of 10 RC holes for 363m on two separate lines 400m apart at Kangaroo Caves Prospect, 12km southwest of the Central Vanadium Oxide Prospect. 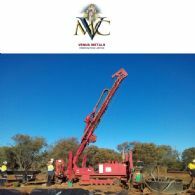 Venus Metals Corporation Limited (ASX:VMC) announces new JORC 2012 vanadium oxide mineral resource confirmed. 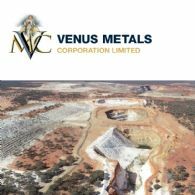 Venus Metals Corporation Limited (ASX:VMC) announces Youanmi Vanadium Project world-scale JORC 2012 Vanadium Oxide Resource confirmed. 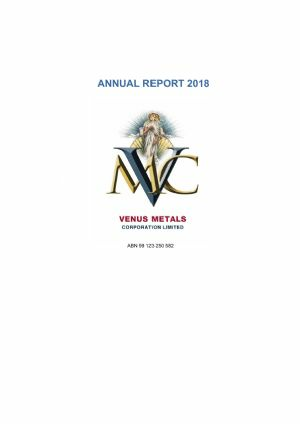 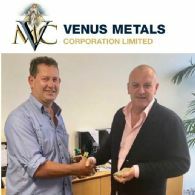 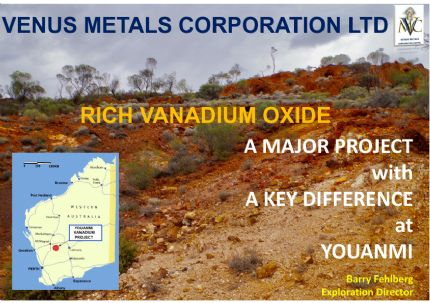 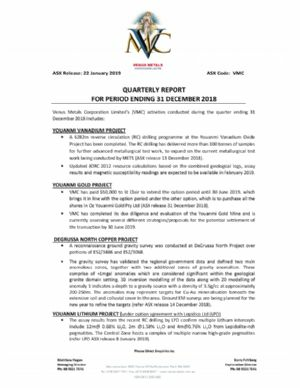 Venus Metals Corporation Limited (ASX:VMC) submit their report for the half-year ended 31 December 2018.